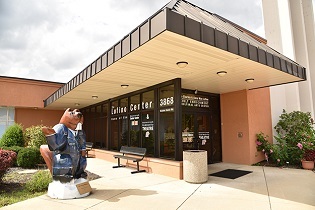 Many Beavercreek residents are interested or involved in the arts, but without BCT there would be only limited opportunities for local residents to participate in theater in Beavercreek. Talented residents, including numerous young people, would have to go to other communities for theater opportunities. Achieving our primary goal, community enrichment, was limited until we constructed a permanent theater--a wonderful new home for BCT. Through the generosity of the Lofino family, who provided space in the Lofino Senior Adult Enrichment and Cultural Arts Center, and numerous government organizations and private supporters, we now have the home we need, and are on the way to achieving our full potential! Our new home has allowed BCT to offer full seasons of theatrical productions (including well-known musicals, comedies, and dramas), to publicize and encourage community involvement in the arts, and to develop a Children's Theater program (offering youth productions and courses in theater production and performance). In order to achieve our primary mission, we are strengthening our membership and building teams of people in all areas of theater, including acting, directing, set design and construction, lighting and sound, costumes, make-up, stage management, and publicity.